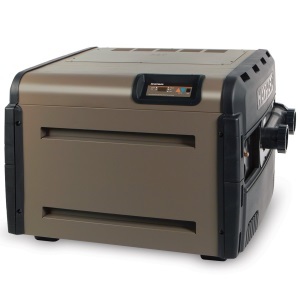 If you are the owner of a swimming pool, either above- or in-ground, you might want to consider buying a pool heater. Although the perfect water temperature is a matter of personal choice, installing the heater will make the difference, and you will like better comfort and convenience. No matter of the weather, cooler or warmer, swimming pool heaters provide comfortable temperature year round for a great swimming experience or simply fun. Simply stated, by installing a pool heater you will extend the swimming season and increase the value of your property. Let’s go to the market to see what is available for you to buy. The operating principle of the typical pool heaters is similar from one type to another. The unit produces heat to warm water, which comes in from the pool. Water passes through a heat exchanger where it increases the temperature from where, as warm water goes back into the pool, using the circulation pump. The first impression is supply abundance – there are so many models and options. Swimming pool heaters can be classified in four main types: electric resistance heaters, heat pumps, gas heaters (natural gas or propane) and solar heaters. Well, five... the fifth type is the wood-burning heater, but it is the least convenient option. Each type has pros and cons. To decide which one fits your needs, learn something about them. Here are some customers’ testimonials and expert opinions. Electric resistance heaters are the cheapest to buy, but the most expensive to operate. These heaters are simple, compact, clean and reliable, suitable for all weather conditions. Electricity price is the reason they may be recommended for spas or small above ground pools only. You may find a model for $500 and don’t hesitate to buy it if your needs are moderate or low. Great examples also with the good reviews are Hayward and EcoSmart. Heat pumps are popular because of their high efficiency.They also use electricity, but in an innovative way by moving the warm air instead of generating the heat, which results in huge savings. Modern materials and technology allow heaters to be durable and environment-friendly. The initial investment is high, $2000 and up, water is heating slower, air temperature must be above 45 degrees F... Nevertheless, you will forget all that at the end of the month when you receive a lower electricity bill. Heat pumps are ideal for frequent use if you want to enjoy your swimming pool on a daily basis. A great example, which is also popular among homeowners is a model Hayward HeatPro. Gas pool heaters are somewhere between the previous two. Slightly less expensive than heat pumps, natural gas and propane units are superior when you expect fast work regardless of the conditions. However, gas prices are not as affordable as used to be. Several times higher monthly costs than the heat pumps’ operating charges may influence the decision. 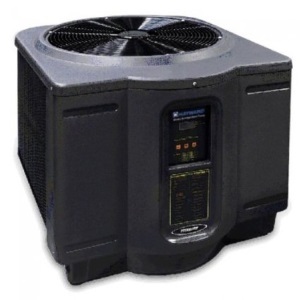 This type of pool heaters is meant for the homeowners who are using the pool occasionally. When combined with the above heat pumps, you will get the most energy efficient way to heat and cool the swimming pool either in warm or cold weather. Gas heaters are also the most used type, where model Hayward H400FDN from Universal H-Series is the most sold one on Amazon. Solar pool heaters are ideal for sunny climates, but even there, users have to prepare a secondary heating source for cloudy or colder days. Solar water heater systems are the most expensive solution to buy, they work slowly, but with almost no costs to operate and are environment-friendly. There are two types you can choose; glazed – used for colder climates protected by the tempered glass and insulation, and unglazed, very cheap and used mainly in warmer regions. The best starting point for decision-making is to put on paper your needs, wishes and specific conditions. Service network (this is very important as the professional installation and maintenance of your pool heater can determine the performance, efficiency, and the lifespan. Note: If you live in the southern warmer area, solar panels and heat pumps are recommended types, but for the northern/colder region, gas pool heater is the favorite product. The longest lifespan is found on solar 15-20 years, then heat pumps 10-20 years while the shortest lifespan is found on gas, 5-years. One of the first things to figure out is the size of your swimming pool and desired water temperature rise. According to these numbers, you will decide about the required performances of the water heater. There are calculation methods that include the surface of the pool, its volume, shape, the difference between the water and surrounding air temperature... but in general, you will need a 200-300K BTU heater to heat an average 10.000-20.000-gallon pool. The time needed for heating should also be taken into account. According to the company that produces popular Hayward pool heaters, model H250 which has gas input of 250,000 Btu/h is able to heat 10,000-gal pool for approximately 10 hours, and raise the pool water temperature 30 F. When calculating, it is recommended to go one size larger – more powerful water heater will do the job faster, and with lower energy consumption. The swimming pool brings a lot of fun, but if you are not careful they can cost a lot to run. According to some studies, evaporation accounts for approximately 30% of the total heat loss of a pool. With the higher pool temperature and wind speed, the greater evaporation rate is. According to energy.gov, the outdoor pool can absorb between 75% and 85% of the solar heat and it would be perfect if it is all kept. Consider investing in the thermal pool cover or solar blanket. According to some experts, a pool cover can reduce the heating costs by as much as 60%, but it depends on the type. If installing a new pump, choose a two-speed or variable-speed model. 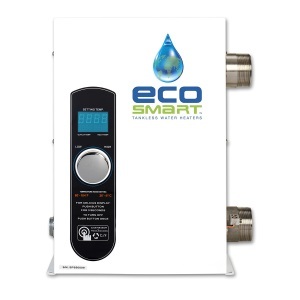 It will help to save on water filtration costs, enhance the performance and maximize your savings. This pump type comes with the better quality, is more durable and is much quieter than cheaper single-speed type. Also, clean the skimmer basket and backwash the pool to maximize the performance and keep the pool cleaner. Reduce the filtration time to at least six hours daily, but keep in mind not to compromise the water quality. Set the thermostat to the desired temperature which will be kept consistent as long as the thermostat is working properly. Either the pool is used for swimming or as a kid’s play area, the temperature can vary, but it seems that the ideal temperature range is somewhere between 77 F and 82 F.
Lower the temperature by just a degree or two and you will save up to 25%. Select an Energy Star model. Install the timer to optimize the use of the pool pump. Protect the pool from the wind. This would require you to put a fence, wall or vegetation. Check the BTU (a measure of heat output i.e. energy-producing capability) of the unit, and energy efficiency (in COP units). Gas units have different types of ignition systems (millivolt vs. electronic start heaters). Review usage options: control panel, self-diagnostics capability, safety sensor function... Check installation prerequisites and mounting kit. Ask about warranty availability. If you are not sure about measurements and features, ask an expert to help and a pool heating audit. He may add into calculation factors unknown to you and recommend a solution according to the latest market findings. Choosing the “right” swimming pool heater is a personal choice. Someone might be attracted by the available advanced features, BTUs, price, deal, fuel availability and so on. According to the statistics and experts, it seems that the gas pool heater is the most popular system for heating the pool. Especially today, they are eco-friendlier than before, have Low NOx gas emission and are high-efficient.